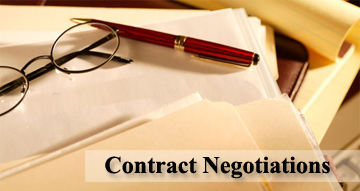 All major corporations have a significant number of ongoing contracts with vendors. It is our experience that most follow the 80/20 rule, i.e., 80% of their vendor spend is with 20% of their vendor population. With that concentration in mind; it has become extremely important to establish fundamental strategies in dealing with this universe. This article will start early in the vendor relationship-the negotiation process. Develop a contract negotiation strategy with your internal customer for each bidder. Ensure you have clearly enunciated the strengths and weaknesses of each side in the negotiation. Prioritize what you want to ensure you get from the bidder during negotiations. List those things which, if you had to, you could give away to the bidder. However, never give anything away without a return. Make the vendor pay a price for each concession. Always start from your contract draft. Never use the bidder’s draft. You want the vendor to be playing by your rules, and this will help ensure that you stay in control of the negotiating process. Be professional and fair. You want to ensure that both the bidder and the internal customer see the contract as fair and as a positive vehicle for the ongoing relationship. Continually communicate with all players during the process to ensure that no misunderstandings occur and that nothing is left to later interpretation. If the process takes longer than planned, that’s ok. Do not shorten the process by giving up on items you would otherwise fight for, just to meet an artificial deadline. Both parties will regret this later. Have your customer’s lawyer produce the black (red) line document that shows the changes made during the most recent session, and review it thoroughly for scribe errors. Never let the internal customer eliminate all but one of the bidders until the contracts are ready to be signed. they may believe that they are ready to choose, but until the final contracts are negotiated and signed it is always possible for something to occur that will change the deal. This idea has the additional advantage of ensuring that pressure is kept on each bidder in order to enhance the customer’s negotiating position. Neglecting some of the basics above may likely lead to significant long term issues with your vendor and eventually, either a contentious renegotiation or contract cancellation. Build the contract correctly, and you lay the foundation for a mutually advantageous relationship. This entry was posted in Blog and tagged Best Practices, contract, contract negotiation, process negotiation, strategy, vendor negotiations, vendor relationships. Bookmark the permalink.